After Cecile concert we want to ride and rock the rhythm again. 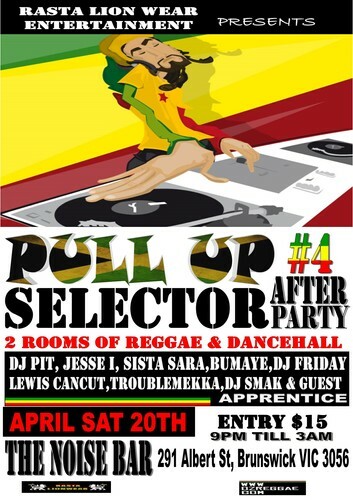 Rasta lion wear Entertainment proudly present After Party Pull Up Selector 4. 2 venues of reggae and dancehall. Yes one venue will be playing strictly reggae and the other strictly dancehall. Dj line up mad! Yes we murder the tune with subsonic boom. Rasta lion wear stall will be open on this event selling handmade rasta wear, reggae, African and Jamaican clothing and jewelry. Ethiopian food stall in the mix but will announce it a bit later.